First it was JPMorgan, then Morgan Stanley, now it's Goldman Sachs. Late last week, JPMorgan's "other" quant, the house bear Nikolaos Panigirtzoglou - never to be confused with the permabullish Marko Kolanovic - published a report in which he said that while he maintains a risk-on, he warned that "investors should start building up hedges against the risk of a repeat of the past two weeks' yield curve inversion episode." Panigirtzoglou also observed that "the relative signs of complacency in US equity markets relative to rate markets implied by Figure 1 illustrate the need to hedge our equity overweight." 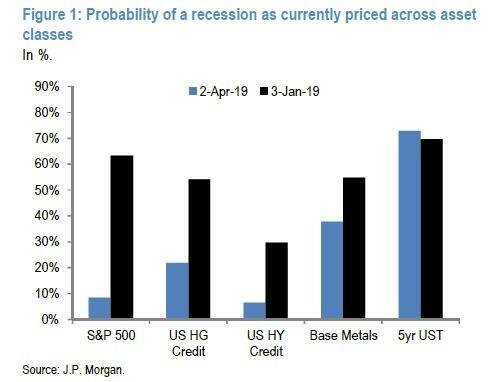 As the chart below shows, whereas equity markets now price in just an 8% chance of recession and junk bonds only 6%, bond markets are virtually certain a recession is coming, with implied odds of over 70%. Panagirtzoglou's warning must have struck a nerve among JPMorgans clients, because just two days later, another JPM strategist, Mislav Matejka, published a report that directly debunked the conclusions of his JPMorgan colleague, suggesting that equity investors have been worried about the wrong yield curve. Specifically, instead of using the inverted 3-month/10-year inverted Treasury yield difference that has stock traders on edge, he recommended looking at the spread between the 10-year and 2-year Treasury yields - which is about 18 basis points away from inversion - and which apparently is great news: "Far from being bearish, the current 10-year to 2-year spread of 18 basis points is consistent with 12 percent S&P 500 appreciation over the next 12 months." It wasn't just JPMorgan however, because on Sunday, Morgan Stanley's chief equity strategist, Michael Wilson, who also lately has been moonlighting as the bank's in house bear, wrote that "institutional investors seem preoccupied with what everyone else is doing, trying to figure out whether every last dollar is already in the market or if there’s more to go. To say that FOMO – the Fear of Missing Out – is alive and well would be a gross understatement." And when looking at this investor euphoria from the side, Wilson concluded that "when investors are more focused on what others are doing than on fundamentals, the trend has probably run its course. Naturally, this anxiety was also present in December, but on the downside. Then it wasn’t Fear of Missing Out, it was just plain fear!" Wilson's warnings did not end there, and the report warned that despite the market's tremendous rally since Christmas Day, "it’s misguided to assume that the profits recession has magically ended, and I see an increasing chance that it turns into an economic one if companies decide they want to protect profits by cutting labor, capex and inventory." In short: Morgan Stanley joined JPMorgan in warning investors to hedge equity exposure now. And now it's Goldman's turn. In a note published on Monday afternoon, Goldman strategist Alessio Rizzi discussed something we have repeatedly touch on, namely that despite being one of the strongest rallies for risky assets, flows into equity funds have been abnormally weak YTD. 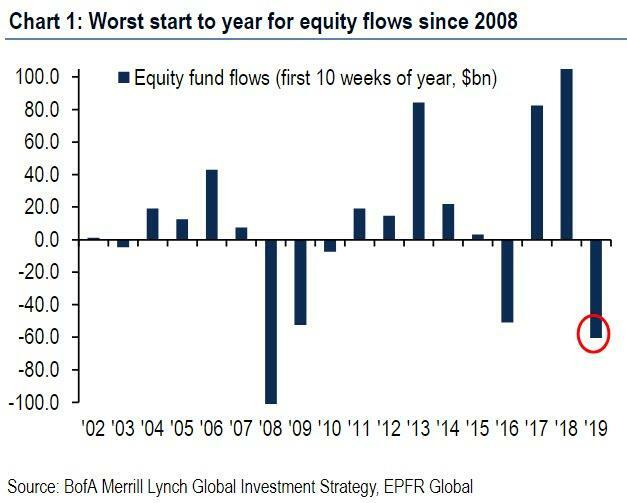 In fact, as BofA recently noted, 2019 has been the worst year for stock outflows since 2008. Expounding on a paradox first touched upon by Deutsche Bank in February, the Goldman strategist writes that "historically fund flows tend to be closely correlated with equity performance, but the recent divergence is one of the largest since the GFC." And so, echoing the bullish thesis presented by JPM's Marko Kolanovic, Rizzi writes that "this metric suggests a lot of investors have not participated in the equity rally and this has increased "FOMO" (fear of missing out)." And while investor sentiment measured by risk asset inflows appears to have picked up marginally, in particular in credit where fund flows have recovered from end of year outflows, fund flows into ‘safe’ assets have continued, led by flows into government bond funds resulting in the market "jaws" that Goldman's David Kostin recently said is the biggest concern to Goldman clients. The explanation for this divergence is obvious: a more dovish Fed has boosted the fixed income aggregate, which attracted most of the flows YTD - roughly $55 bn in credit funds and $30 bn in government bond funds. Meanwhile, within equity, fund flows in EM equity remained stronger than DM, supported by better China data, while Europe continued to be the least favored region. 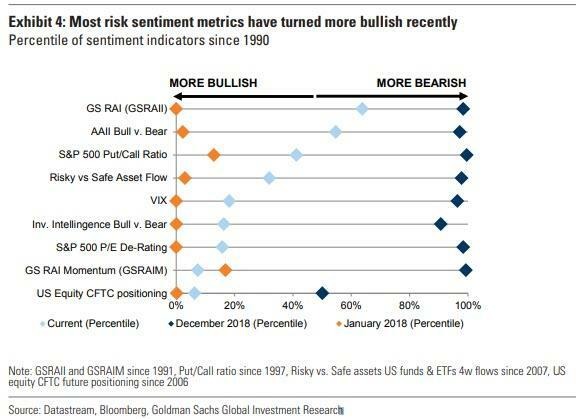 To Goldman, the combination of worse macro fundamentals, or "bad news is good news", investor preference towards the growth factor and political uncertainty explains the declining positioning toward equities. However, other risk sentiment metrics are suggesting a more constructive view among investors in recent weeks. In particular, future positioning is now close to January 2018 highs, and RAI momentum - which tracks risk aversion over short-term horizons - has increased materially. As a result, whereas overall investor positioning continues to pick up, it remains relatively neutral and still less bullish compared to January 2018 levels. 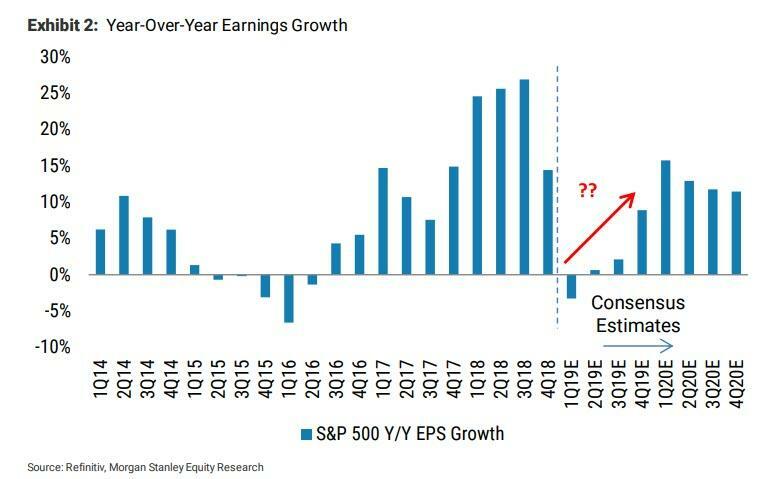 Which brings us to the main Goldman point, one which Morgan Stanley noted earlier today, namely that going forward only "good news will be good news" - as Rizzi writes, while "risk appetite can pick-up further" it will only happen alongside better growth data, which Goldman's economists expect in the second half of the year, contrary to Morgan Stanley which expects the earnings recession to drag on for much of the year. And judging by Goldman's conclusion, not even the FDIC-insured hedge fund is especially enamored with its economic optimism, which is why, after JPMorgan and Morgan Stanley, Rizzi writes that "we remain constructive in our asset allocation, but we would add protection hedges as risky assets continue to outperform and volatility resets lower." ... means that the banks - if one reads between the lines, since the house calls are still all decidedly bullish especially, at JPMorgan which remains convinced that S&P 3,000 is just around the corner - are now actively dumping risk to retail investors, who at least for now, are happy to buy it all.